Reducing the environmental impact of the metal finishing processes carried out by prestigious awards trophy manufacturer, Special EFX, was high on the agenda when developing a new water treatment plant at its facility in Stratford-upon-Avon. 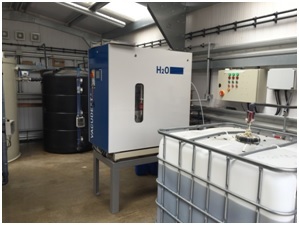 By installing a specialist evaporation system, process water recycling expert NHE was able to virtually eliminate the need for regular wastewater collection and disposal. The project has reduced the volume of wastewater by 90 per cent as well as delivering overall cost savings for the plant. 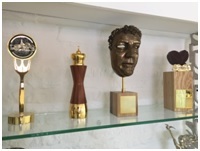 Special EFX designs and creates unique and exclusive awards for many prestigious events including the British Comedy Awards, Music Week Awards, TV Quick Awards and Grand Designs Awards. The trophies are fashioned in a variety of materials including stainless steel, aluminium, pewter, glass, crystal and acrylic with metals accounting for 90 per cent of business. The process for each can involve a number of intricate stages of manufacture, including water-jet cutting, electroplating, hand and machine polishing, stamping, laser engraving and digital UV printing. Unique effects are then created using a variety of surface applications including anodising, powder coating, printing, lamination and polydome. Metal finishing is a key process for Special EFX with finishes available in gold, silver and bronze, and water plays a key role in many of these processes with up to 24,000 litres of water processed in one month at the plant. These processes generate a significant amount of wastewater containing high levels of metal finishing contaminants which cannot be discharged to sewer. Stuart McLeish, Project Manager at Special EFX worked with James Wright, Electronics Technician from subsidiary company Future Energy to replace the company’s current method of wastewater recycling with an on-site water treatment plant with the aim of significantly reducing water costs for the business. With increasingly stringent regulations governing wastewater discharge and greater quantities of wastewater being produced, there is a growing need for more efficient and cost-effective methods to remove metals and other contamination from process wastewater. Previously, Special EFX was using an external waste management company to dispose of the contaminated wastewater. Special EFX was concerned that, in addition to the cost of tankering away, wasted water was one of the biggest disadvantages from an environmental and financial standpoint of disposal using a waste management company. Lancy Technology, part of NHE, provides a single resource for process water recycling requirements, including effluent treatment, wastewater processing and metal and chemical recovery. Keith Allen, business development manager at Lancy Technology worked with Special EFX to find a solution through its innovative Vacudest system. Using the innovative state-of-the-art Vacudest wastewater evaporator, Special EFX is able to distill clean water from its industrial wastewater and can also dispose of the crystal clear wastewater internally. The treated water is recycled back into the manufacturing process to enable zero liquid discharge production. Each unit is based on a modular design which enables it to be tailored to meet precise installation requirements. Additional factors such as a maintenance-friendly design and simple control systems, including internet connection for remote diagnostic purposes, are other properties which help to produce the highest quality distillate from each Vacudest facility. The team at Special EFX are also now able to monitor the Vacudest system from their desks through VNC control.